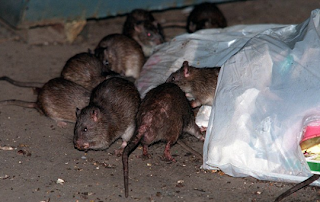 As the flood waters caused by Hurricane Sandy put New York City under siege, rats may be scurrying to the streets in order to escape the flooding. According to Rick Ostfeld of the Cary Institute of Ecosystem Studies in Milbrook, New York, rising water will force rats out of their underground lairs and into contact with humans. According to Ostfeld, this could result in a rise in infectious diseases carried by urban rats, including leptospirosis, hantavirus, typhus, salmonella, and even the plague. That is so gross! Hopefully Ostfeld’s wrong in his assessment but, then again, he is an expert.